My 46 day streak of wearing Alabama Crimson Tide shirts/scarves/pants/hats will come to an end tomorrow. I didn’t wear a shirt every day, all day, but at some point during the past 46 days, I had on something representing my beloved Alabama. No matter what the outcome, I will proudly wear my Alabama shirt tomorrow as Tuscaloosa celebrates another season of playing in the BCS Championship. This one will be tough. Playing another SEC team is weird and yeah, I know the controversy over us being in the game. 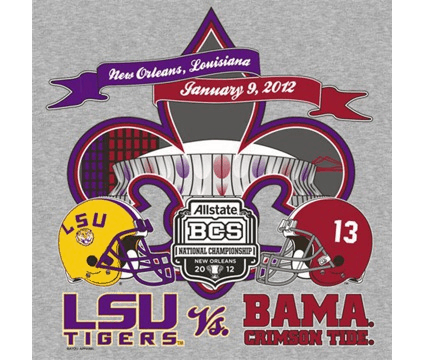 The point of the BCS is to have the two best teams playing for a championship and it worked. It just happened that the two best teams are from the same conference this year. I wish I was in Nola for this game, but I will have to make do with watching it with friends and texting the rest. It will be exciting no matter what. Living in Tuscaloosa is the next best thing to being there. The town is INSANE this week, similar to the last time we played LSU, and I absolutely love it. Hounds tooth and crimson adorn every car, house, business, and child. Its been a long 4 weeks since we’ve seen our boys play and now it’s only 12 short hours. ROLL TIDE ROLL!!!! Oh.My.Gosh!!! I am SOOOO excited for this game! AHHHH!!! Roll Tide Roll!!! Was that not a FABULOUS game??? I’m still excited! I’ve got my shirt and I wore it today with great pride.